Let’s talk blush! First, Do you like your blush to shimmer? Or, do you like blush with a matte finish? Finally, do you prefer blush that gives you the look of a glowing flush? My favorite blush creates the “glow from within” flush! 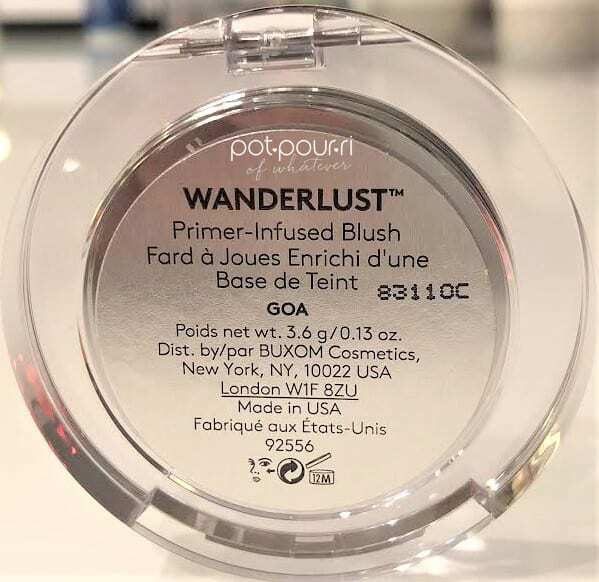 I can’t wait to tell you about my newest blush obsession, the Buxom Wanderlust Primer Infused Blush. 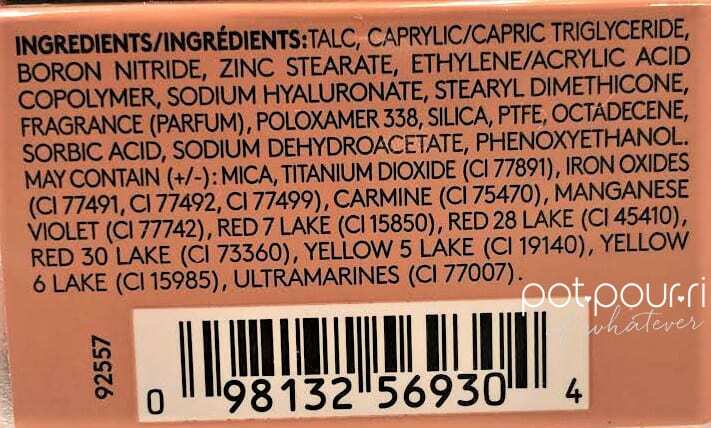 You may be wondering why you need a blush infused with a primer? One reason is you can wear your blush alone. In other words, you don’t need to wear foundation because you can wear the blush on bare skin, As a result, your complexion will have a natural flush. Second, primer infused in the blush gives you a long-wearing flush. Hence, primer locks the luminous blush color onto your cheeks. Therefore, primer makes sure the blush is long-wearing. 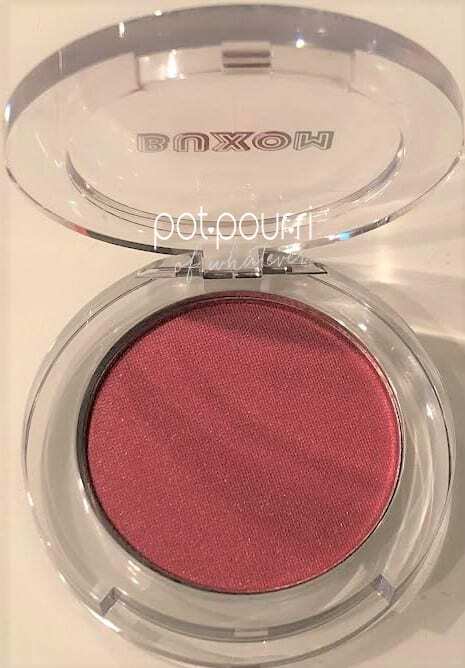 Finally, You can find the Buxom Wanderlust Primer Infused Blush at Sephora, Ulta, Macy’s and on the Buxom Cosmetics Website. Also, the Wanderlust Primer Infused Blush retails for $22. To begin, the Wanderlust Blush comes in a silver, mirrored box. 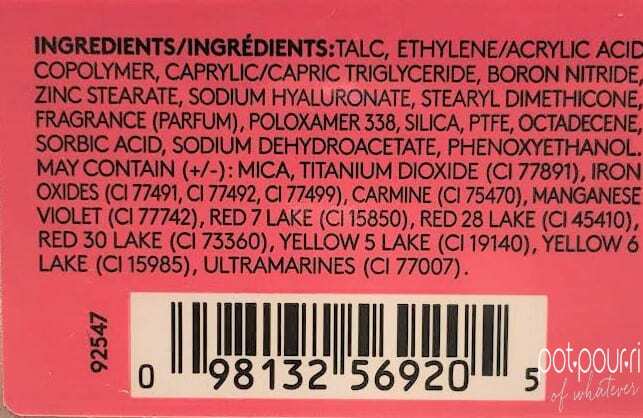 Furthermore, taped to the outside of the box, on a colored paper, the shade name and the specific ingredients of the shade. 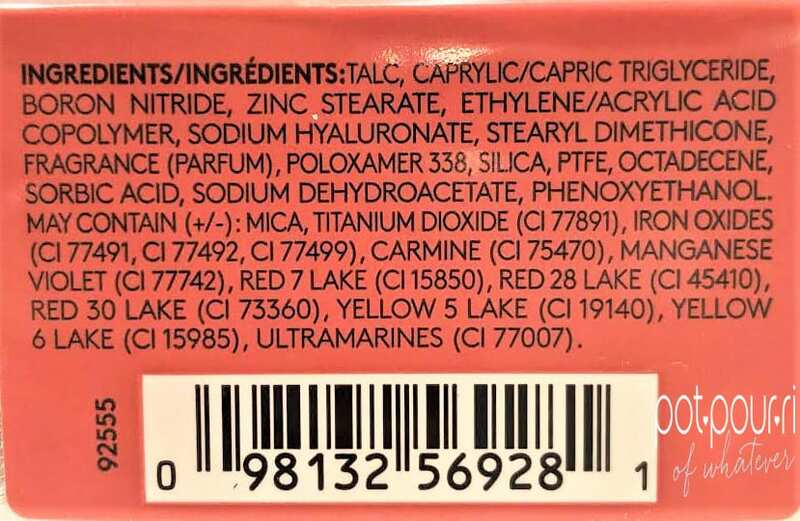 Best of all, the paper on the box, with the information, is the color of the blush inside. In addition, I love the blush compact. One reason is, it looks modern and sleek. Also, I love that it is clear, sturdy plastic. As a result, you can see the blush inside. Fortunately, the Primer Infused Blush has more than primer infused in the formula. 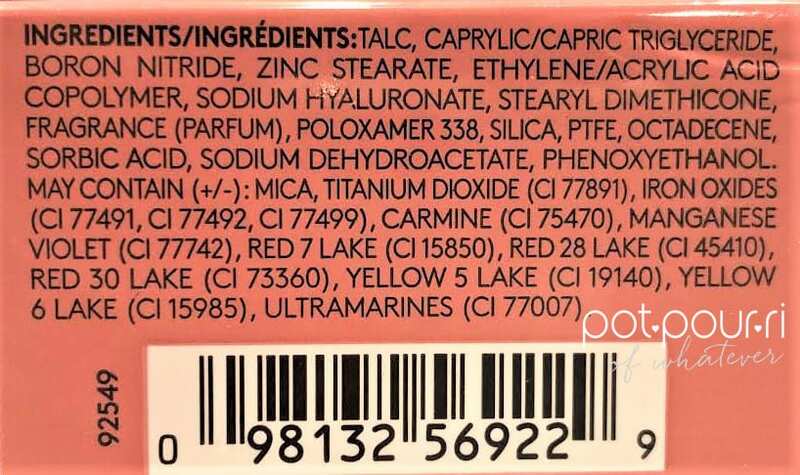 In fact, the blush also includes skincare in the ingredients. Most important, the formula has Hyaluronic Acid , to hydrate your skin. In addition, the blush has a colorless base so that the blush blends seamlessly. Also, the formula has multi dimensional pearls that create luminosity to make your cheeks glow. Finally, the Wanderlust Blush, with every stroke of the blush, releases a light, beachy scent. Furthermore, the blush is easy to blend. Also, it feels silky and smooth. Therefore, it makes your skin feel smooth. Finally, the blush has highly pigmented colors. Moreover, the color you see in the pan is the color you get! 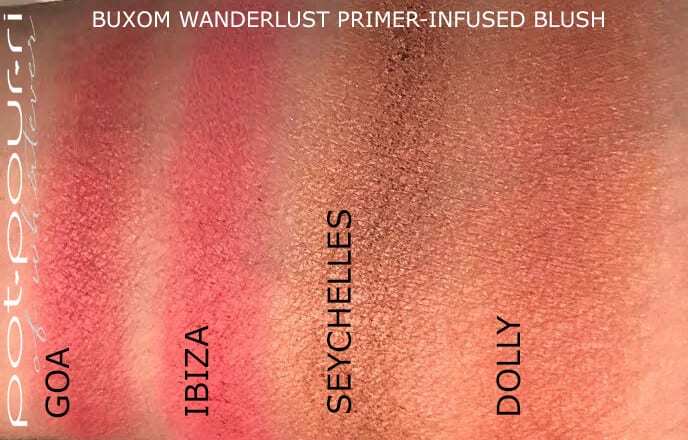 Buxom’s Wanderlust Blush comes in six shades. I purchased four shades. Although, I loved all six shades. First, Goa, is a Berry shade with a luminous finish. Second, Ibiza, is a Pink shade with a luminous finish. Third, Dolly, is an Absolute Mauve Shade that has a luminous finish. Fourth, Seychelles, is a bronze shade that has a luminous finish. The other two shades are Mykonos, a peach color, and Havana, a rose shade. They are all so gorgeous, I want them all! 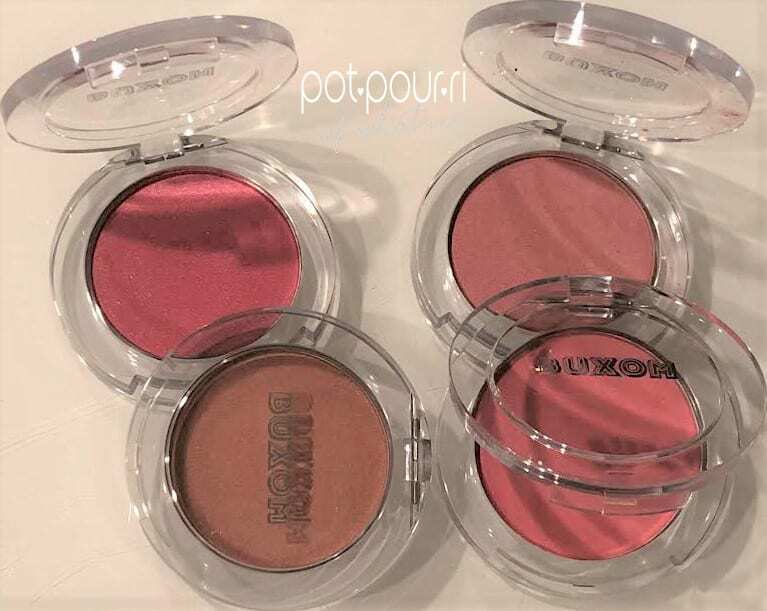 Buxom Wanderlust Primer Infused Blush Last But Not Least……. I’m obsessed with the new Wanderlust Primer Infused Blush. First, these blushers make your skin glow. The glow is so beautiful it’s as if you are glowing from within. Instead of having a shimmer, the blushers have a sheen. Last, the only thing I have to warn you about is the blush has super pigmented colors. Therefore, you only need to apply one brush stroke. However, then you need to diffuse the blush, and blend it. You’ll look like you just came back from a vacation! I can’t wait hear what you think! 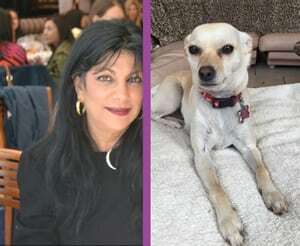 Please write to me in the comments below.